Welcome to Mos Le'Harmless; a quaint pirate settlement that is home to, not one, but two taverns, a bank, a fish market, a clothing retailer, and a cutlass/scimitar merchant. 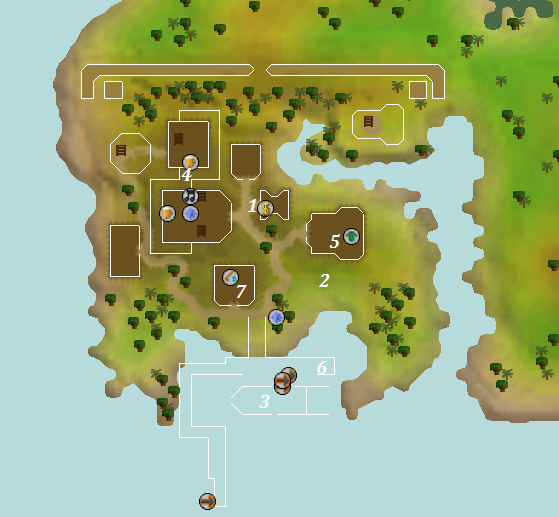 Only buccaneers who have completed the Cabin Fever quest are able to sail to this island. Since these pirates speak a strange dialect you will need a Book o' Piracy to understand them. 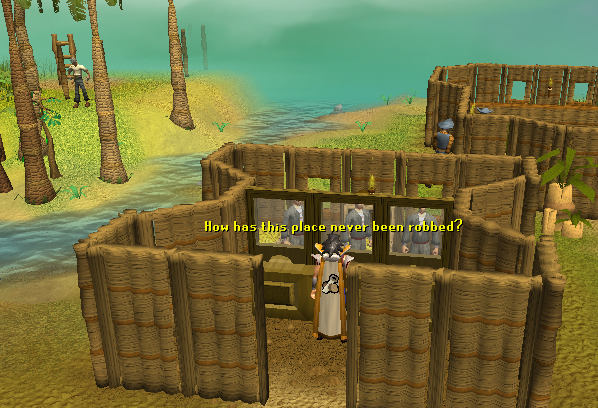 After completing the Rocking Out quest, you will no longer need the book to understand the pirates. 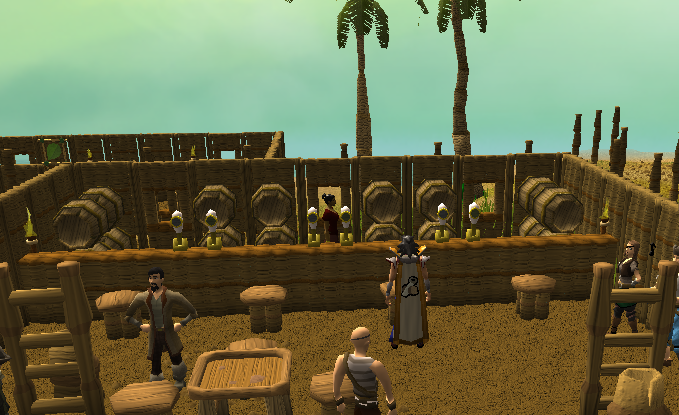 The kind folks at the Bank of RuneScape have conveniently placed a branch on the island for your own personal use. This stark black pillar "seems to stand out." 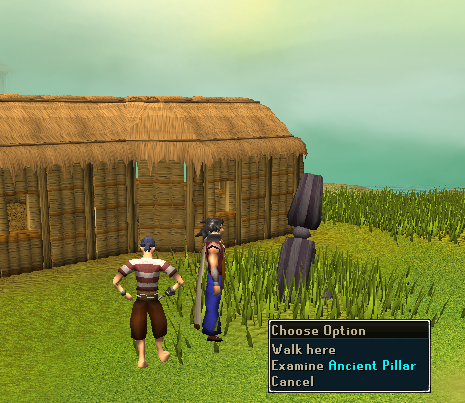 If you ask Dodgy Mike about the pillar's origins he will try to sell it to you. Then he will confess that he doesn't know where it came from and it probably belonged to the settlers who came before them. It is possibly a hint to another quest involving pirates. The Aventurous is Bill Teach's ship. You can use it to travel back to Port Phasmatys. 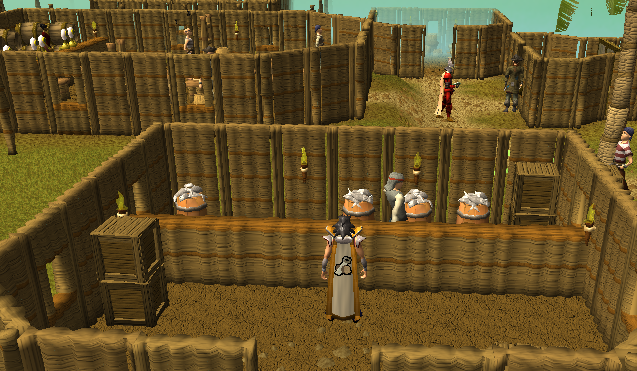 These two inns offer refreshment for thirsty pirates. You can buy the dangerous local specialty "Braindeath Rum" here. It's a hearty drink that lowers five attack, range, and Defence levels while giving you three strength levels and one mining. Dodgy Mike owns a shady shop that sells a variety of exclusive pirate clothing. The clothes are tradable to anyone who is a member. Smithing Smith's shop sells scimitars (how is that for alliteration?). Smith will also sell you two untradable cutlasses and a rapier if you talk to him. Brass Hand Harry lost both of his hands during his pirate career so Smith had to make him this special cutlass. It costs 1,040 gp and gives the following attack bonuses. Due to the unique nature of the hilt, this sword also gives +4 stab, slash, and crush Defence. An arrow bounced off this cutlass and killed Jenkins, and when the medic tried to revive poor Jenkins he turned his bones into bananas and the monkeys got ahold of him. Now Smith is reselling this incredibly lucky sword to you for the low price of 2,560 coins! This sword is so lucky it will give you +6 Defence against stab, slash, and crush attacks. This is the "finest blade ever wielded by a privateer." The honorable Mallard fought to the death with a giant squid using this sword. It is the best sword that Smith sells and it costs 25,600 coins. Two feet Charley was unlucky enough to get both of his feet chewed off by a shark. Now to get revenge he sells the very creatures that harmed him. Mama La'Fiette is the owner of "The Other Inn." Talk to her to buy some refreshing spirits. Harpoon Joe is the proprietor of the "House of 'Rum'." He sells the same drinks that Mama does. He has a harpoon for a hand due to an accident that involved a storm and an albatross. 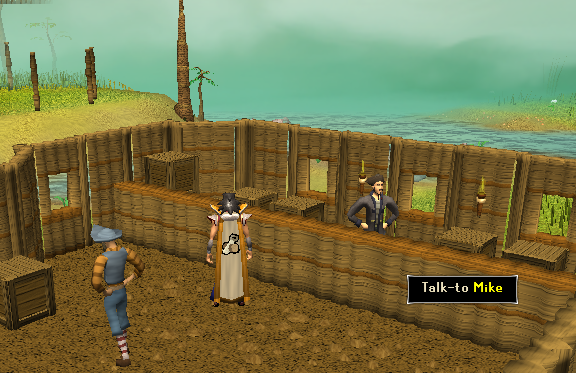 Bill Teach is the sailor who teaches you how to be a pirate during the Cabin Fever quest. He will take you to the island and back to the mainland. If you happen to lose your Book o' Piracy, this is the man to talk to. This shady seaman is the local tailor. He will sell you a variety of "previously used" pirate clothes. Smith is Mos Le'harmless' master smithy. He can sell scimitars up to mithril and several one-of-a-kind cutlasses. Charley lost both of his legs in a terrible fishing accident that involved a viscous shark. Now he is the owner of a shop that sells raw fish. Many pirates call Mos Le'Harmless home. 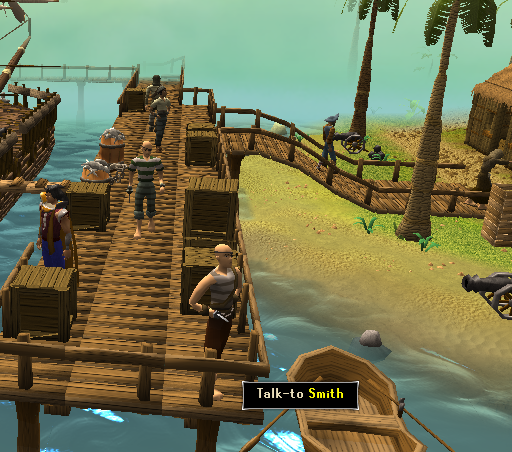 Some of them will give you interesting tidbits about the life of a pirate, while others will only say "Arr!"